i remember hearing this song on the radio as a kid and it was a huge hit in the 80s. it wasnt until i heard the original version that i was blown away by the power of the song. i only learned/realized this year (what?!!) 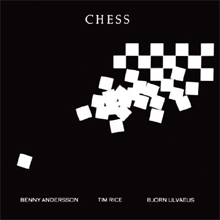 that the song was from chess the musical, written by tim rice and music by benny andersson and björn ulvaeus (from ABBA, yes that group). whitney’s version is very pop, palatable to a larger audience but im starting to love the musical version more and more. chess the musical involves a romantic triangle between two top players, an american (frederick trumper, loosely based on grandmaster bobby fischer) and a russian, in a world chess championship, and a woman (florence) who manages one and falls in love with the other; all in the context of a cold war struggle between the US and the soviet union, during which both countries wanted to win international chess tournaments for propaganda purposes (source wikipedia). i know him so well is sung by florence, the lover, and svetlana, the estranged wife, reflecting on their relationship with anatoly (the russian chess player). the london cast version was recorded by elaine paige with siobhán mccarthy but here’s paige (florence) and barbara dickinson’s (svetlana) hit version from the original concept album (1984). when the show moved to broadway in 1988, judy khun replaces elaine paige as the role was rewritten to be an american. here, she sings this song with marcia mitzman. for the uninformed, judy khun played cosette in les miserables for the original broadway cast and was singing voice of pocahontas (whose version of “colors of the wind” will remain my favorite over vanessa williams’s pop take). this is such a beautiful version i never tire listening to (along with paige’s version) on loop. in 2008 a concert version was staged with josh groban (anatoly), adam pascal (from rent and aida, playing freddie) and idina menzel (of wicked and glee fame, as florence). i do think her version of “i know him so well” with kerry ellis was an abysmal performance. although i love idina as elpheba, she was just screechy in this version. kerry ellis also played elpheba on broadway. the always magnificent lea salonga sings the song in a tv show in the 90s (probably aired on rpn9). elaine paige sings along with one her biggest fans, susan boyle in this link here. we should remember susan boyle did mention her greatest idol was paige during her famous audition in the tv show, britain’s got talent. there is another version recorded by barbra streisand with richard page in 1992. of course, locally the divine kuh ledesma, with regine velasquez, covers the song here (start at 4:23 if you wanna get straight to the song). another with regine and lani misalucha here (start at 4:09). the australian pop group, steps, also performs this song (accent is heavy!). link is here. stumbled upon an amazing male version by john barrowman and daniel boys. they didn’t bother changing the lyrics here. awesome! im all for im-all-alone songs from musicals (someone else’s story, aida’s i know the truth, and avenue q’s there’s a fine, fine line, etc.) but let’s save that for another day and another blog entry. cheers! so, naminaw ko tanan..hahaha. i always thought it was from jesus christ superstar. or maybe i confuse it with i don’t know how to love him. i like lea’s version, kahit pangit ang video quality 🙂 also kuh. and..the two guys. the 80s versions sound so..80s. haha.